Grandparents Day 2014: Reflections on the Known and Unknown. More More More. One of my son Christopher’s favorite books as a toddler was “More More More! Said the Baby,” by Vera Williams. It’s lovely, a Caldecott Honor Book, published in 1990, with wonderful illustrations also by Williams. One of the three little stories features a blond, white grandma swooping up her Little Pumpkin, a black child. You can hear Vera Williams talk about and read the book here. She wrote it for her grandson Hudson, and expanded it to include other babies. 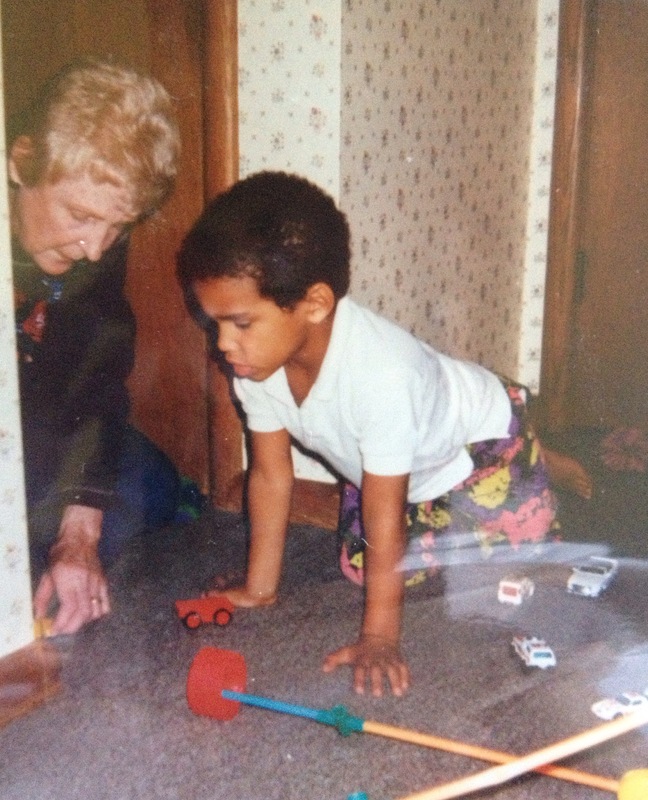 Here’s Chris with his grandma, my mother, who–always with makeup and blond hair just so–never failed to get down on the floor and play with him. My mom, who died 12 years ago, was an incredible grandmother. She loved her (adopted, African-American, African) adopted grandchildren unconditionally; her views on civil rights and racism moved from philosophical to personal, in a thoughtful, decisive way. She would have adored her great-granddaughter Z, born in 2006. I adore Z, as anyone who knows me even briefly is all too aware. Like my mother, I am not biologically related to my grandchild. Z is the biological child of my adopted daughter, Aselefech. Z is genetically related to her aunt (her mother’s twin sister; both girls were adopted from Ethiopia in 1994), but not to her two uncles (my adopted sons). We all have dealt (from varying perspectives) with white privilege, with racism, with humiliation, with stereotyping, with grief. We crazy love each other. Z has a non-adopted 7 year old’s understanding of adoption. She knows she looks more like her mom, aunt, and uncles than she looks like me, since I’m white and they are not. She knows what it’s like when people do double-takes when she says I’m her grandma. 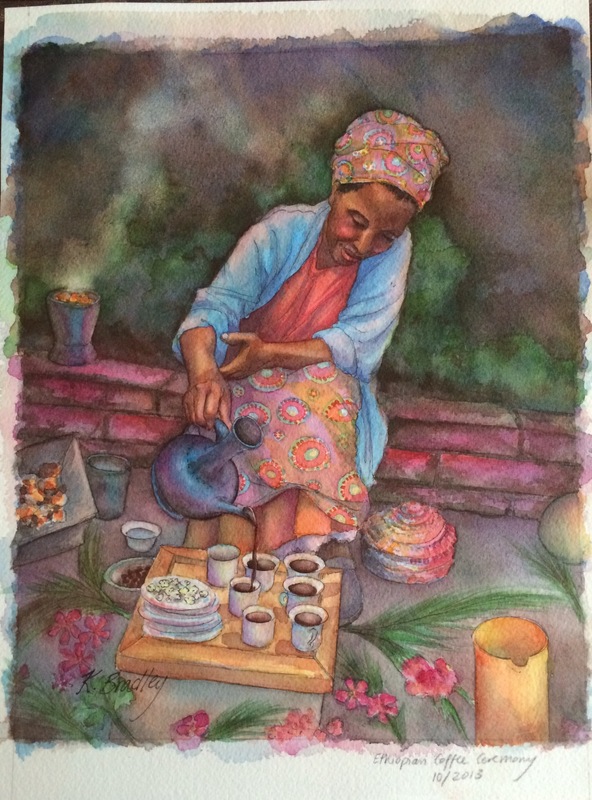 She knew since she was little about her Ethiopian family, in Ethiopia. She had seen photos, and heard stories. 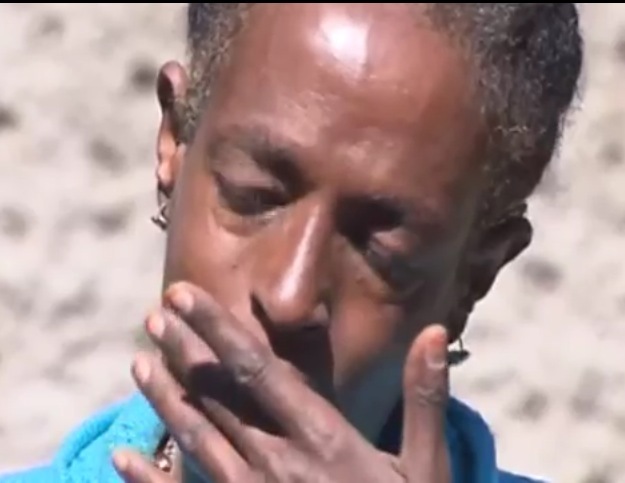 She has visited with her Ethiopian uncle who now lives in Seattle, via winning a visa lottery ticket several years ago. Grandparents can be elusive creatures. They are often old when they become grandparents (I am a notable exception), though not as old as we think they are when we are children. Families used to live over the meadow or above the duplex from the grandparents; increasingly, that has changed. Adoption, especially international, creates a whole other level to knowing grandparents. As an adoptive parent, when my children were little, I thought about their birth mothers, then fathers, maybe. I gave little thought to other members of the family tree: the grandparents, the siblings, the aunts, uncles, cousins. Over the years, as my children grew and my heart opened, I gave much more thought to their first families. Some are known, some are unknown. Some are gone. Some could still be found. 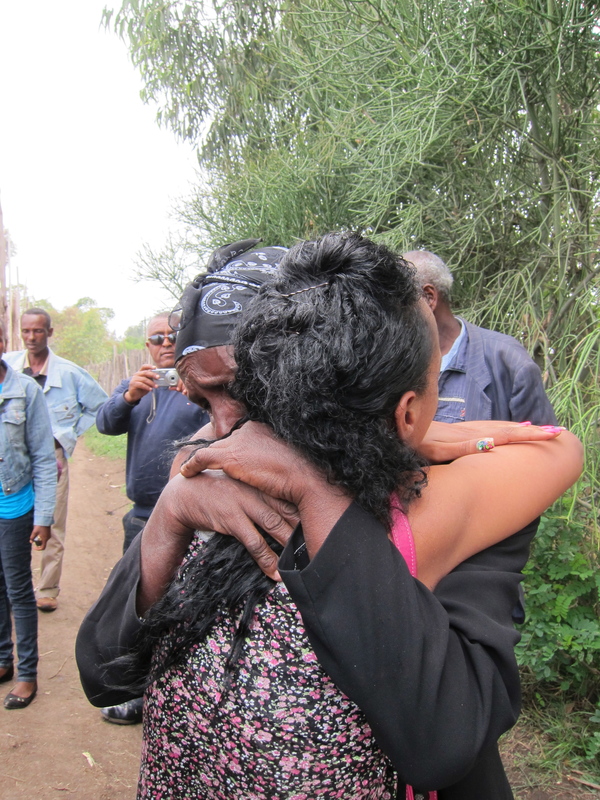 During our recent trip to Ethiopia, Z met Desta, her grandmother, Aselefech’s mother. Aselefech had last visited with her Ethiopian family in 2011; this was the first visit for Z. Z did well, though she was understandably tentative. Like Aselefech, she looks like her Ethiopian relatives, yet she can speak to them only through a translator, one of the most poignant, painful parts of international adoption when the original language does not endure. Conversations with unfamiliar relatives can be awkward when we speak the same language and share the same culture, religion, education, and economics. It didn’t matter here. 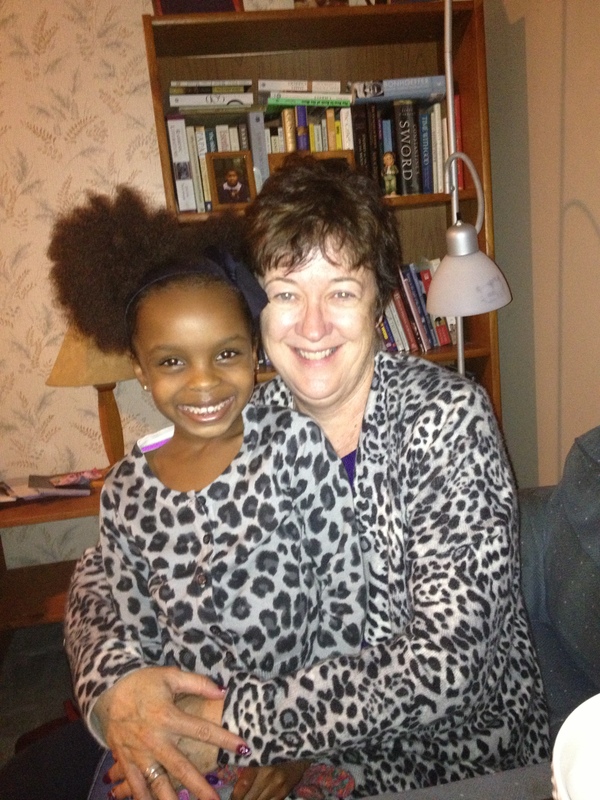 Desta loved Z before she met her on this visit, as she loves all her grandchildren (her 6th is expected anytime now). She cannot scoop up Z as my mom scooped up Chris, because Desta did not even meet Z until Z was almost 8. She missed those early years, as she will miss most of Z’s daily life; we don’t know when she and Z will see each other again. We will do our best to keep in touch, to send photos, to connect. So much heartache in adoption, along with so much love. I am filled with gratitude and wonder that Z met, hugged, talked with, smiled at, and said goodbye to her Ethiopian grandmother, along with aunts, uncles, and cousins. Chris lost his grandma when he was 12, and I know he misses her deeply. All my children do. Their grandmother was a powerful force of unconditional love in their lives. My maternal grandparents died before I was born. I have good memories of my dad’s parents (we watched the Lawrence Welk Show together, and they came over for Sunday dinner each week), but I can’t say I knew them all that well. I wish I did. It’s astonishing how little we know about people just a generation or two away from us. Adopted children (who grow up!) deserve to know their families. (Safety obviously has to be a factor, but fear of the unknown should not be.) We adoptive parents need to embrace, at least emotionally, our children’s first families, including the grandparents who may well have wanted to know and love them. What a gift and blessing to know our grandparents, and to know their stories: what their childhoods were like, how they fell in love, what their happiest days were, what memories make them smile. I cannot imagine not having Z as my granddaughter; I love sharing stories with her and making memories. Being a grandparent has made me understand and appreciate so much in this wild life. For all the losses and the missed time, what richness we have. Yes, it’s imperfect. It’s tempting to see only absence, rather than presence, and too many people have been marginalized or made far more vulnerable than is fair. Still. Seek out more, more, more. Swoop up loved ones, known and unknown. Ask questions, listen to stories, and insist on understanding what the possibilities are. Tomorrow is not promised to us. People die. While you can, seek out more, more, more. Happy Grandparents Day. Thinking of beloveds, in heaven and all over earth. As an adoptive parent, I feel very strongly that the voices of birth parents need to be heard and listened to, in our own families as well as in adoption legislation and policy. These excerpts are from a 2010 thesis written by (US citizen) Sarah Brittingham for her M.A. in Development Studies at the International Institute of Social Studies in The Hague. Despite their obvious and vulnerable role in international adoption, birth/original/first parents have received too little attention in terms of academic work, and certainly in terms of post-placement services. This thesis sheds additional light, along with the MSW work of Kalkidan Alelign. 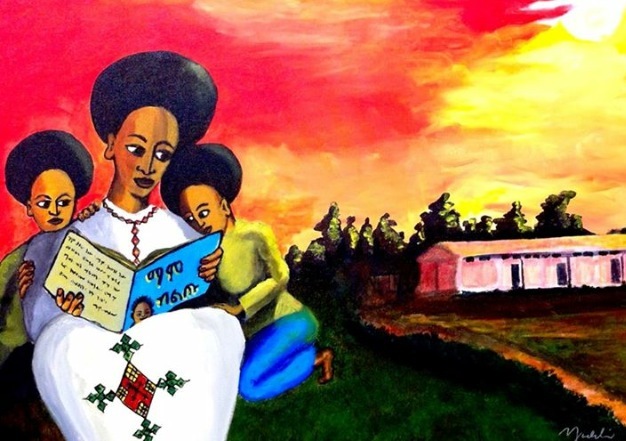 You can read Ms. Alelign’s important thesis in my post, Ethiopian Birth Mothers After Relinquishment: MSW Research from Addis Ababa University. That notion of “a link between two families” is challenging to define, as it is a form of open international adoption. I believe that will be the model for the future of inter country adoption, a model that relinquishes fear and falsehoods. If adoptions are to continue, they must be ethical, transparent, and fair. I would love to hear the insights of adoption agencies on this, on what the agreements or inferences were and are regarding post-placement contact. My sense, based on anecdotes, is that increasing numbers of adoptive parents are reaching out and contacting Ethiopian birth families on their own, but I have no hard research on that. I do feel certain that enormous confusion exists over what information the birth families were promised, following the placement of their children. There is great hope, even expectation, among many Ethiopian birth families that their children will go back to Ethiopia, and contribute to the country, and perhaps to the birth family as well. 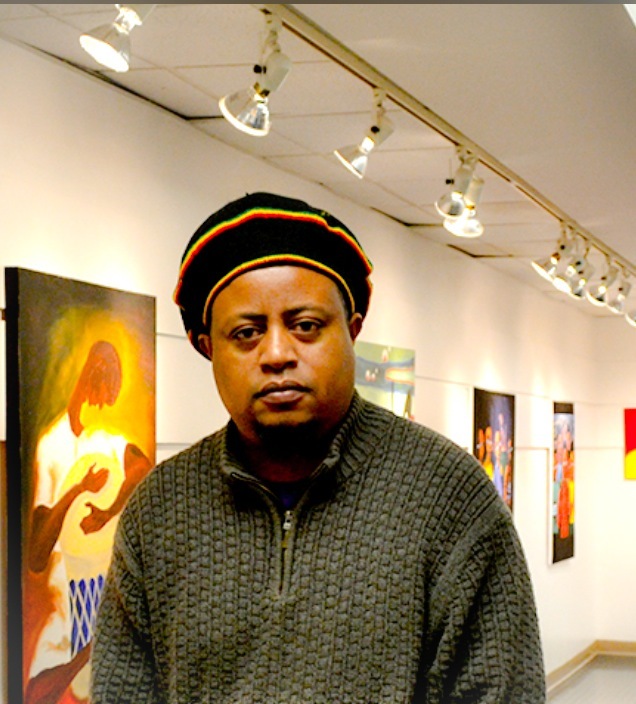 We–adoptive parents, adoption agencies, and adoption policymakers–need to hear these voices of Ethiopian original parents and of adopted persons. We need to insist on additional research on intercountry adoption outcomes, especially as related to birth families. We need to insist on improved, equitable services for all involved. Many thanks to those who are researching these issues. May those who are proposing new laws, policies, and funding genuinely hear the voices and the needs of marginalized first families.